Butternut squash makes a wonderful substitute for pasta thanks to its structure. This simple dish allows the squash noodles to shine in a Sage Brown Butter sauce. Ready in less than 30 minutes, this makes a wonderful cool weather side or main dish. Prepare a large baking sheet with parchment paper. Place the spiralized squash noodles on the parchment and drizzle with the olive oil. Gently toss to coat with the oil. Bake for 7 minutes. Noodles with be softer but not completely soft, however they will continue to soften outside of the oven. While noodles are cooking, melt the butter in a large skillet over medium heat, stirring constantly. Within 1-2 minutes the butter will begin to brown; add the sage leaves at this time, stirring to saute them until they are fragrant and darken. The entire process only takes 2-3 minutes. Remove from heat. Toss the squash noodles in the browned butter to fully coat and serve immediately. 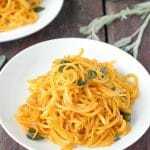 *To prepare butternut squash noodles without a Spiralizer, try this method.